Could your home’s CURB APPEAL be greatly improved by a landscape renovation? How old is your landscape? A residential landscape in Des Moines is usually meant to last 15 to 20 years, according to industry standards. After that, plants often begin to outgrow their placement and/or lose vigor. Perhaps an overhaul is due. Are you spending too much time on maintenance? A properly-planned landscape is low-maintenance (unfortunately, there’s no such thing as no-maintenance). Are you driven crazy by constantly pruning overgrown shrubs? Do you need to spray your plants to prevent pests and disease? The maintenance headaches are often the result of a poorly-planned or overgrown landscape. Earthly Possibilities installations are designed to work in harmony with your style and your home’s architectural features. Do your plantings and walkways beckon visitors to the front entry? A welcoming landscape is a key feature for curb appeal and significantly adds value to your property. 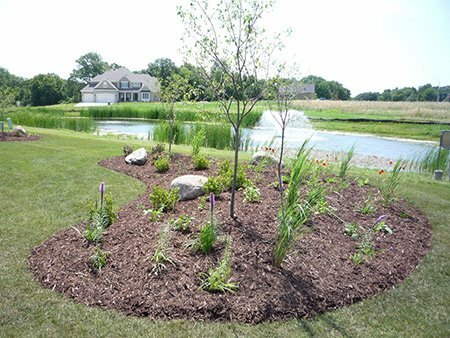 Call our professional Des Moines Iowa landscape designers today at 515-577-6903 to schedule your design consultation.